Imagine all the little perks of vacation with the comforts of home included. Enter the staycation. Vacationing at home doesn’t have to be boring or stressful. In fact with the right preparation, you can enjoy your time off without the struggle of being a tourist or spending too much money on a fancy hotel. All you need is a few days of planning to create the staycation of your dreams. One of the best parts of staying at a hotel is walking into a clean room every day without having to lift a finger. Unfortunately, we don’t have maids at home to help with this, which is why we need to prepare in advance to maximize our relaxation time. Plan to clean all areas of your home several days ahead. Include laundry in this so no there is no need to do anything other than enjoy once you go into staycation mode. No one wants to worry about dinner while you’re trying to create a vacation experience. Make sure to pick your favorite recipes and prep them in advance. Diversify your staycation menu by planning to order a couple of meals from your favorite restaurant or eatery. If you’re the type that finds cooking relaxing, consider trying a new recipe as one of your at home activities. Just make sure to pick up the necessary ingredients during your early shopping and you will be able to make cooking during your staycation an experience. Incorporate your favorite wine, music and celebrity chef (on screen) - to create a personal cooking class. Consider what you need most to help you feel relaxed, and bring that into your home. If you’re into the outdoors, use your space to create a sanctuary. 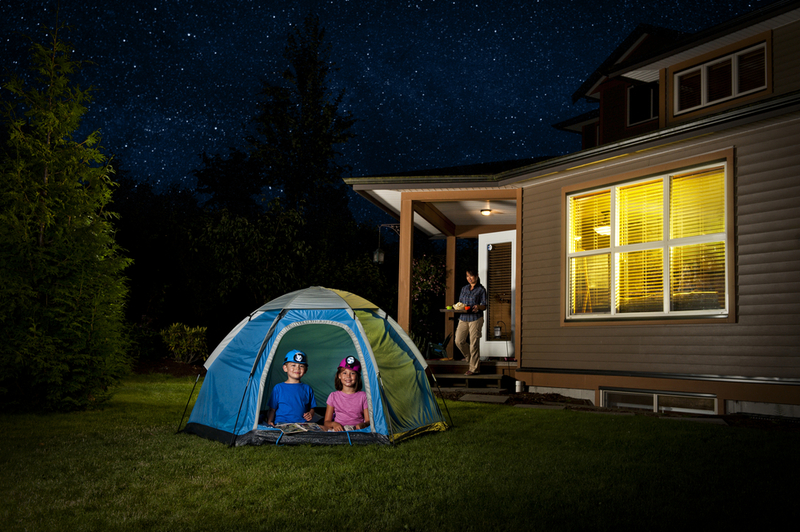 String up lights, set up a camping space, and bring your favorite book along. Now you’re enjoying the great outdoors. If the spa is more your pace, set up your bathroom to feel like a one. This can include candles, air purifiers, and bath pillows. You can make your staycation even better by booking an at-home massage. If you have kiddos, make sure to set up play-stations for them to enjoy in between activities. The chores are done, the meals are planned and the scene is set. All there is left to do is prepare to get comfortable. Whether your home is the coziest place on earth or it could use a few extra touches, there are always little things you can do to maximize your level of comfort. Buy new bed sheets to add a touch of hotel luxury to your staycation. Add a final Air B&B touch by buying nice carpets to spread throughout your designated spaces. Finally, adjust the lighting to match your mood, this way you can easily fall into the ultimate relaxation mode. It is important to know what you will be doing from the beginning. This way you won’t have to spend time wondering how to entertain yourself. A staycation doesn’t have to mean being lazy on the couch or sleeping in. You’re off from responsibilities so you will want to make the most of your time. Map out exactly what you want your days to look like and what needs to be done to make that happen. After, delegate a task to the family for quicker preparation. Before you know it, you will be ready for the ultimate stay at home vacation.